In the great race of social driving games, Forza Horizon 2 just pipped DriveClub and The Crew to the finishing line and can therefore be seen as a trailblazer for its genre. But has it got enough to keep the others at bay or will it soon be overtaken? Car analogies aside, it's an interesting time for racing games. The power of the next-generation consoles and prospect of gamers being permanently hooked up to the internet have both expanded the playing field somewhat. Other games have tried the always-online open-world format before, such as Test Drive Unlimited and Burnout Paradise, but they sometimes flattered to deceive, mainly because of the hardware they were restricted to. With the Xbox One and Forza Horizon 2, there is far more scope. Greater processing power and dedicated servers mean that more players can interact with each other, the road maps can be far larger, and the driving itself? Well, it's Forza isn't it? Playground Games, the development team behind the first Forza Horizon for Xbox 360, was given a mighty party bag of tricks before it started adding its own magical touches. Forza Motorsport 5 was a massive leap forward for the franchise thanks to the graphical prowess of Microsoft's latest console and for it Turn 10 produced hundreds of beautifully-rendered vehicles in all shapes and sizes. Playground could therefore use those models in its own project - and to great effect we must say. Plus, Forza 5 introduced the Drivatar system to learn the habits of real drivers and use that info to create a greater variety of artificially intelligent opponents instead of reproduce dumb drones, as in other games. It took a massive number of Forza 5 races from all of its community to fine tune and ensure that each Drivatar acts, give or take, like a human racer - and Horizon 2 benefits enormously. It uses the same stored Drivatar information, giving a much more realistic, online-opponent-style experience when playing solo through the career mode, and even expands upon the concept with the bots learning where you most like to drive as well as the style with which you play. In concept though, Forza Horizon 2 is much like Forza Horizon before it and plenty will seem familiar, even though the graphical vista has changed along with the location. You will be racing and driving around southern Europe rather than the US and that helps Playground enforce more diverse scenery than ever before. It also aids the creation of a new dynamic weather system - something that's a trend for next-gen driving games. The weather system looks at your location, the atmospheric conditions and other key factors and can therefore change the weather to suit. It will also affect how you play the game as it has an obvious effect on driving too, such as roads becoming slippier the harder it rains - which we have to say is a wonderful, beautiful experience both visually and audibly. It can even drizzle or throw up fog. And as time is also a factor, driving in dusk, at noon or during the night also all make for a different experience. It is because of these factors that no two races in Forza Horizon 2 feel the exact same. You can even go back to race the same event and because it rains during it, you get a very different experience - and potentially a very different result. The Road Trip feature is also new. While the last Forza Horizon was based around a one-location festival, in the follow-up you switch from region to region after each championship is completed, driving there amongst your rival Drivatars of friends and others thrown in for good measure. If nothing else, these road trips, which do not count towards credits or championship points, can be considered tutorial sessions for whatever car class you've chosen to race next, as you can choose to do them in the car you've just acquired. Plus, as with every time you drive a car, be it for leisure or competition, you earn style points which can eventually unlock skill points to spend on perks. Perks are chosen bonuses that add a sort-of role-playing element and are another addition to this year's game. They work in skill tree fashion, requiring previous perks in the area to be unlocked first before becoming accessible and nearly all of them help you gain more bonuses for the way you drive or types of races you win. Also new in Horizon 2 is ANNA, the female-voiced Automated Natural Navigation Assistant, which - or maybe who if you feel attached - can be fully voice controlled through the Kinect sensor if you have one. As well as lighting your route from A to B, you can ask the system to recommend championship races or other events to complete. Xbox 360 Forza Horizon players will no doubt recognise some of the features though, such as Barn Finds - where exclusive classic cars will be hidden in barns across the landscape - and showdown events, like racing against a jet display team. But there's plenty of variety and additional surprises that we don't want to spoil here. Let's just say it's worth you deviating from the beaten path from time to time. We will mention the smattering of Bucket List challenges scattered about though. Drive to one of those and you'll be given a dedicated challenge in a fantastic, specific car. Anything from a point-to-point time challenge to successfully pulling off a set number of jumps is on offer. It breaks the pace a bit. You can also compete in these Bucket List challenges co-operatively, which is one of the many ways that Forza Horizon 2 seamlessly incorporates online multiplayer play. Other ways are to drive up to a car meet or choose to switch to Online Road Trip or Online Free Roam modes. You can do both privately with friends or just join a public session. We have to admit that we'd get a better grasp of the wonders of playing online with other members of the public when there are other members of the public available to play with. After all, we have been playing a review version of Forza Horizon 2 that, while completely fully-functional and as good as the finished version, is only in the select hands of a few worldwide. Therefore, the online community is far less populated than it will be come launch day. That means we didn't get to race many opponents at once online, although in every event we did partake, we thoroughly enjoyed it. Especially when we saw what we presume to be another games-playing professional skid horribly into a tree and muck up their race as we left them for dust. Bwah ha ha. The same can be said for the in-game Car Clubs. Up to 1,000 players can join the same Car Club and compete against fellow club members in ladders, earning credits for reaching the higher echelons. However, the Car Club we're in currently has two members. And we're bottom. These minor hurdles aside, even having fewer people available to test with and against, we can see their benefit greatly. Indeed, we spent hours and hours each night playing online rather than solo, no matter how few of us there were. And when there were too few, the Drivatars in the solo career mode were almost as good to race against. There are some odd moments though. For example, Ben, the host of Horizon both in voice and in graphical form, is ex-Eastenders actor and former teen heartthrob from the 90s, Sean Maguire. He does a very decent job of it too, even though it comes as a shock to see his likeness so accurately rendered the first time. It makes us want more past and present Eastenders stars to appear in games: Todd Carty's Modern Warfare anyone? Natalie Cassidy as a playable fighter in Killer Instinct? Er, perhaps not. Plus, as you can race off-road this time out, it's weird to see friend's Drivatars suddenly veer off the tarmac and plough through an orange grove or whathaveyou. It adds a randomness to proceedings that's not unpleasant, it must be said. For all its bells and whistles though, where Forza Horizon 2 really shines is when you are behind the wheel careening along. The Forza games have always got the driving gameplay part right in our opinion and this is no exception. It's super quick, even without 60 frames per second - it runs in 1080p at 30fps as a developer's decision to keep everything stable - and terrain just whips along far quicker than on many other race games we could mention. Indeed, it feels even faster and therefore more exciting than Forza Motorsport 5, which seems a little pedestrian in comparison. But then it should, Horizon 2 is an arcade racer after all, one with truly stunning graphics (especially when it rains) and it never lets up on the sense that you are in control of a high-powered beast of a car. The off-road sections are superb. Like us, we think you'll be wishing for more of them and will possibly choose championship classes to ensure that you go off-road as much as possible. No matter how pretty the Italian countryside is, it's better to batter it down in a Ferrari F40. If we were being super critical then Forza Horizon 2 feels a little too much like the original Forza Horizon at times. The concept and ultimate goals are the same. But so much more has been added that it would be unfair to mark it down for that. Indeed we see it as the better game, hence a higher score. The comparison is relevant though for those who didn't like the original. If you didn't, then we’re not sure whether you’ll be more enamoured by Forza Horizon 2. We doubt it. 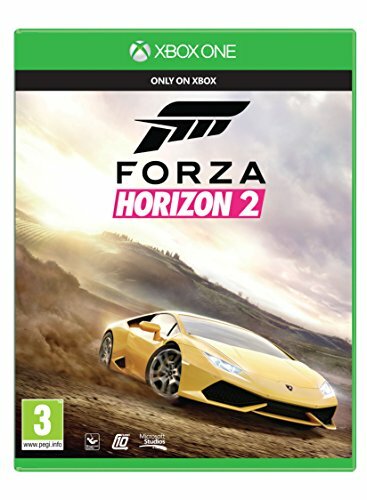 Lovers of fast-paced racers will though - and Horizon 2 offers that in abundance. The online and social features are so integral that once you find and pair with friends or even strangers, the differences between the two will become apparent very quickly. As for newcomers to the franchise, perhaps because the Xbox One is your first console, prepare to be thrilled by what we consider the finest next-generation driving game to date. There is so much to do on its vast map, even when just playing by yourself, that you’ll be enjoying it far longer than most other games this year. And there are more than 200 cars to collect along the way, for those who like that sort of thing. It also puts a significant marker in the sand for DriveClub and could very well be the game to finally give Xbox One owners something to crow about over their PS4-owning chums. However, if you're a diehard Forza fan then keep in mind that all the off-road madness in Horizon 2 makes this much more of an arcade racer, a different beast. But a beast of a game all the same.